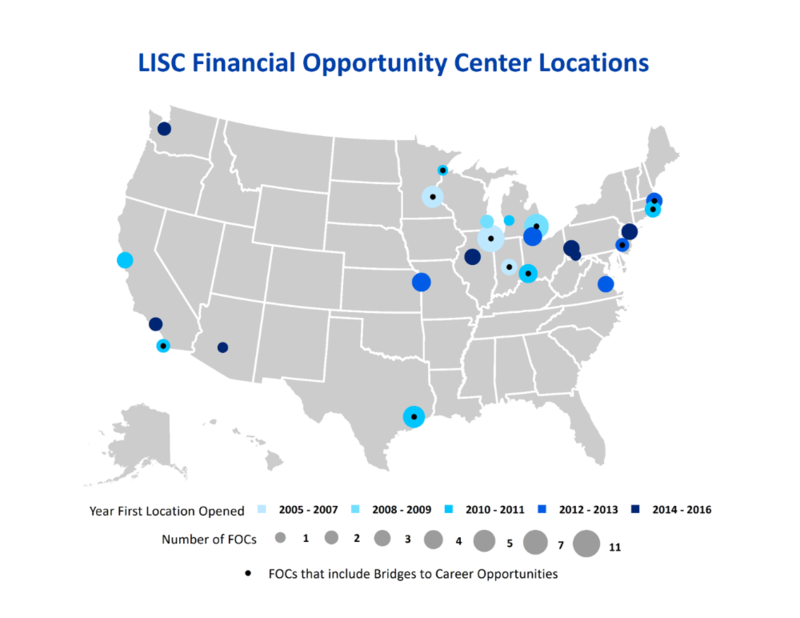 LISC supports a national network of 80 Financial Opportunity Centers in more than 30 cities across the country. Financial Opportunity Centers (FOCs) focus on the financial bottom line for low-to- moderate income individuals. This means changing people's financial behavior in a way that encourages them to make a long-term commitment to increasing income, decreasing expenses and acquiring assets. The Financial Opportunity Center model is not a distinct program or organizational entity, but rather, a new way for agencies to conceptualize and approach their work. As such, the model is deployed within the existing infrastructure of established, community-based institutions that have a track record of providing at least one of the three core services (and, in the case of most FOCs, a multitude of other social, financial or educational services). In LISC's experience, neighborhood-based organizations have the advantages of convenience, familiarity, accessibility and cultural competency. They offer the trust and credibility that are crucial to establishing productive, long-term relationships with community residents. Across the country, a wide spectrum of neighborhood-based nonprofits—workforce agencies, faith-based organizations, Community Action Agencies, multi-service providers, housing counseling groups, prisoner re-entry programs and community colleges—have incorporated the Financial Opportunity Center model into their programming. Click here for more on the Elements of a Successful Financial Opportunity Center. 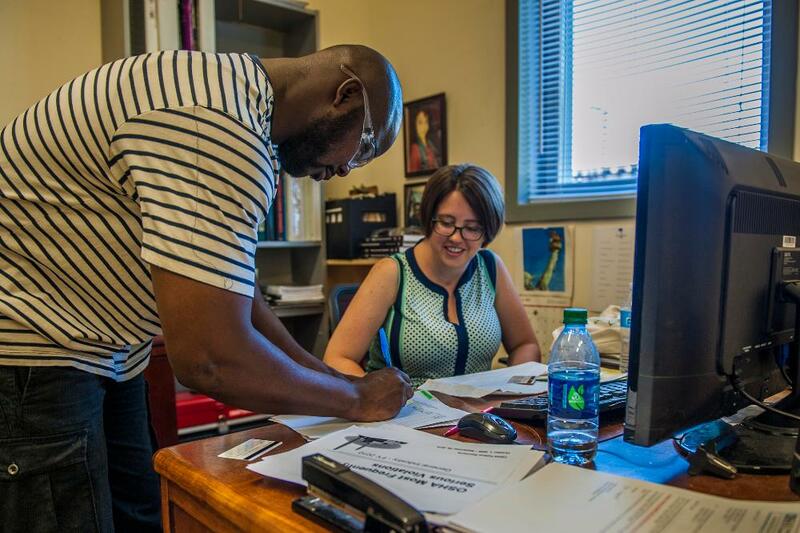 BCO is a supported bridge training program that helps overcome the gaps in academic readiness that can prevent low-wage, low-skill adults from being hired and succeeding in careers that offer livable wages. Many workers are unable to participate in occupational skill training, which teaches workers specific capacities so they are prepared for employment in an industry or field, because they lack the necessary literacy and math skills and have financial challenges that undermine their ability to commit to longer-term training and career development. BCO is designed to address both these issues. BCO provides effective adult basic education contextualized for strong local industries like healthcare and advanced manufacturing. Participants learn foundational skills such as math, literacy or English as a Second Language in the context of their intended occupation. As important, Bridges to Career Opportunities helps participants manage the financial and logistical challenges that can interfere with job training. BCO is a grantee of the federal Social Innovation Fund (SIF), which unites public and private resources to evaluate and grow innovative community-based solutions with evidence of results. The SIF and its private-sector partners have invested more than half a billion dollars in compelling community solutions awarding grants.